The New York District of the USACE recently awarded a contract for $10.7 million to Weeks Marine (Cranford, N.J.) to perform needed maintenance dredging of the East Rockaway Inlet Federal Navigation Channel. The City is contributing $2.7 million to pump the sand two and a half miles farther west along Rockaway Beach in order to restore this section of the beaches which were closed last year because of significant erosion. Tugboats and towing rafts of submergible pipe have begun arriving in East Rockaway Inlet from Barnegat Inlet, N.J., and installation is ongoing, the administration noted. 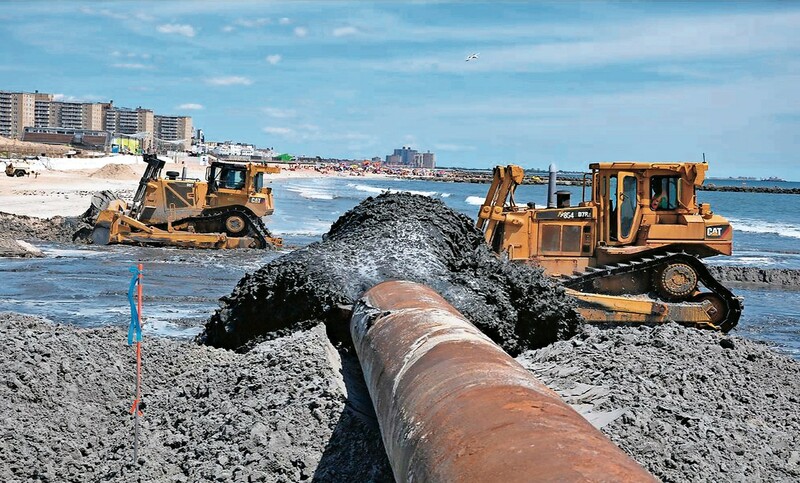 The submersible pipes are being installed in the ocean from East Rockaway Inlet west to Beach 87th Street, where the pipeline will come out of the ocean and onto the beach at Beach 88th Street, east of the most western groin. This week additional pipe and bulldozers, wheel loaders, and work sheds arrived at the staging area between Beach 109th and 110th streets. According to USACE, the corps is expected to begin dredging operations next week, pending the severity of spring storms, with a completion date before June 1, which is the beginning of hurricane season. The work will restore and ensure safe passage for both commercial and recreational vessel traffic through East Rockaway Inlet. USACE is expected to remove approximately, 300,000 cubic-yards of sand from the inlet and place it between Beach 92nd and Beach 103rd streets to replace lost sand due to heavy erosion after last March’s back-to-back nor’easters. The plan also calls for increased beach berms with 1.6 million cubic-yards of sand for initial placement, the extension of five groins already in place, and the construction of 13 new groins—all designed to help reduce the risk from future coastal storms and provide additional resiliency for area residents. The USACE New York District also indicated that it is now in the process of receiving the final approvals from corps headquarters for the Rockaway & Jamaica Bay Reevaluation Report. According to officials, this analysis will authorize the construction, at 100 percent federal cost, of new erosion-control features (such as “jetties” or groins), additional beach fill and reinforced dunes, as well as flood-risk reduction features on both the Atlantic and bayside shoreline of the Rockaway Peninsula.